Lot 1617, a Kodiac colt, sells to Norman Williamson for 135,000 guineas ($184,581) at the Tattersalls October Yearling Sale. 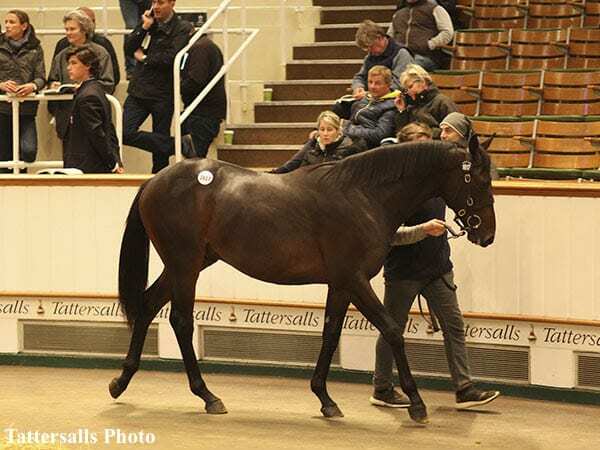 The strong trade achieved at Book 2 continued into the opening day of Book 3 of the Tattersalls October Yearling Sale which was topped by a Kodiac colt at 135,000 guineas (US $184,581), the second highest price ever achieved at this fixture. There were increases in the turnover and average and the clearance rate was an impressive 84 percent. It was into the evening when the headline act on the opening day of Book 3 walked into the ring and provided Ballyhimikin Stud with their second six-figure lot for the day. The Kodiac colt out of the Group 3 winning Sadler's Wells mare Lucky, an own sister to the 2,000 Guineas winner King Of Kings, attracted bids from all corners of the ring before being knocked down to Oak Tree Farm's Norman Williamson for 135,000 guineas ($184,581). “He was the stand out lot for us today. Mags O'Toole and I saw the colt this morning and loved him. He has come from a great farm, he has some size and hopefully he will come back to breeze in the spring. The well-related colt provided an impressive pinhooking result for his owners who purchased him for 40,000 euros ($45,826) as a foal last year. Book 3 of the Tattersalls October Yearling Sale continues on Friday, Oct. 19. This entry was posted in Bloodstock and tagged Ballyhimikin Stud, James Hanly, kodiac, Mags O'Toole, Oak Tree Farm Norman Williamson, Tattersalls, tattersalls october yearling sale by Edited Press Release. Bookmark the permalink.